Across the nation, mole is rising in popularity! Americans love their Latin food and our dining scene shows it. For a long time chefs utilized Latin staples like cilantro or chipotle - both guaranteed hits. Now, they are adding mole to their list of go-to’s. Traditionally made with chiles, fruits, nuts, and seeds, mole is getting a modern makeover. Mole crosses over to other cuisines, ending up on hamburgers and sandwiches. 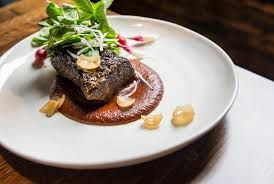 Chef Mataio Gillis incorporates chestnuts and parsnips into his mole sauce to form it into mole comes to its preparation. Enyart even held a program, Summer of Mole, to encourage chefs to experiment with the sauce. Latin is a cuisine of distinct flavors. Not all of those flavors have to be spicy. Instead, the focus should be on flavors and balance. This same balance of flavor is what makes mole a success. Instead of just heat, add depth, bring out needed smokiness, or even sweeten with mole. The varieties of are going to make this sauce your next go-to!